Artist made vintage find: silver [could possibly be sterling, but not marked so this is priced as silver plate], with bronze/gold tone metallic edge. 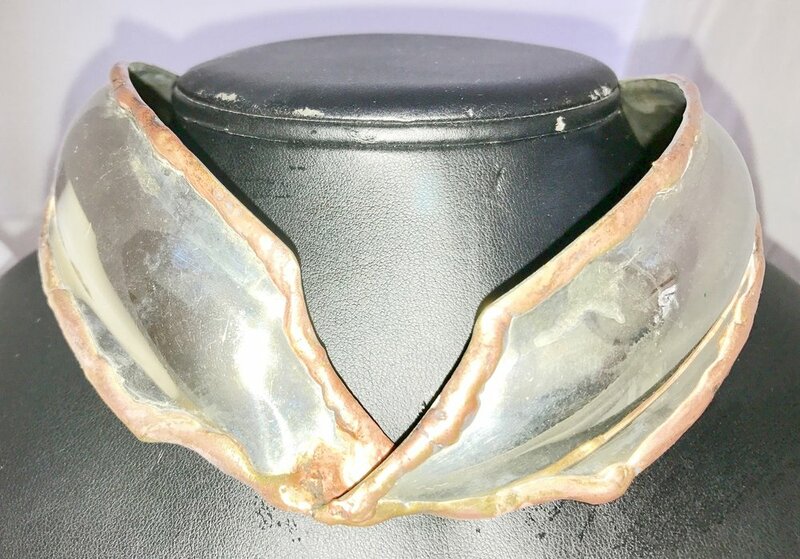 This is a collar, with no clasp. Fits smaller neck sizes. If you're lucky enough to fit this piece, it will be noticed immediately in every room you enter! $125. Handmade sculpted links of brass, form a 17" chain. Aged with fabulous patina. Circa mid-century modern era, or possibly even earlier. Very unusual find. $125. This is a companion piece to Kay, shown in the prior thumbnail photo. Artist-made in the early to mid 20th century from hammered copper, aged with a wonderful patina. 17" long, and so graceful! $125. Mid-length necklace, (approx. 20"), that hangs in a lovely curve of thickly braided gold metallic cord, that shimmers as if composed of tiny bugle beads. Likely made in the 1980's. Huge impact for a tiny price! $35. Stunning hand crafted necklace, possibly of pewter. (no metal markings on it, which is not unusual for handmade objects) This piece looks as if it was made in Mexico or South America. The scallop shape and patina are very flattering as they frame the face. Length can adjust with extender at the back clasp. $145.